When we’re in our home and in our environment, you can almost forget that one of my children has a brain that is wired completely differently than the rest of the household. We’re in Scott’s comfort zone, with his smells and his sounds and his lighting. His brother, Jeb, younger by almost 2 years, knows how to play with him and interact with him on his level and with his rules. He seems almost normal. I’m sorry — those of us with children on “The Spectrum” aren’t supposed to use words like “normal”. I think the term is typical — he seems almost neuro typical. In our little bubble, parenting him is easy. We have our schedule and our family meals and know how to deal with the no sleeping that comes with the way he’s wired. It’s when we go outside of our bubble and I let him out into the real world that the challenges come. For two years, we have sought an appointment at a children’s hospital autism clinic. It took over a year to even get on the waiting list, and we finally have an appointment for later this month. In preparation of this appointment, we had to fill out paperwork and his teacher had to fill out paperwork. I always think I’m steeled against what I’m going to read when I get paperwork back from teachers and professionals, but sometimes, the words are actually painful. With my normal brain neuro typical brain – I can’t fathom a child who has little to no interaction with peers. With my perspective, I tend to think that HE wants it and doesn’t know how to get it. But every parent of an autistic child out there knows that that’s probably not really true. He really doesn’t care. He has his little world. His brother is the one who knows how to play with him on his terms and following his rules and he typically doesn’t need or want anyone else. It’s only been the last two years that Scott has been able to distinguish boys from girls. From his viewpoint, classmates were just a sea of loud noises and indistinguishable characteristics. He couldn’t even pick his sister out of a group of teenaged girls — we believe they all looked the same to him. 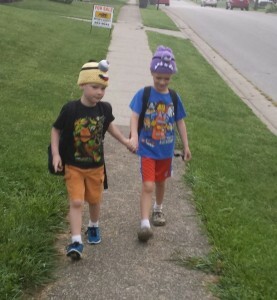 Last year, toward the end of the year, his brother had a friend come home from school with him. Scott said to me, “Why can’t I have a friend home from school with me?” I said, “Do you have a friend?” He said, “Yeah, of course.” The friend who came over is also autistic, and the two of them kind of went into separate corners and played apart. At the end of the day they both claimed that it was the best day ever and wanted to do it again. Scott is starting to be aware of his differences, and he’s starting to not want to be different. I think this is what contributes to the “rude and disrespectful” — he realizes he should have peer relationships because everyone else has them, but has absolutely no idea how to accomplish that and really doesn’t want it. So in trying to establish that relationship, he likely gets a little manic and gets a lot rude. At the end of the day, he’s much happier not seeking out peer relationships and staying on his own. I don’t know what to do about it. I don’t know how to smooth that out for him. I don’t even know if I should. The only thing I know to do is to continue to provide that safe haven home for him – the place where he knows how it will feel and smell and sound — a place for him to continue to develop coping skills against that great big bad world out there. This entry was posted in Autism, Blog and tagged autism, Scott. Bookmark the permalink. As a grandmother of an autistic child, I truly enjoyed your post. It is so easy to consider an autistic child typical when at home, but nothing makes them stand out more than taking them out of their element. My grandson just turned 13 and looks about 8. He speech is still stilted, and now he as acquired a habbit of bobbing his head up and down. We think it’s stress, but his doctor tells us that lots of “spectrum” children do this and usually outgrow it by 12 or so. Well, he’s thirteen…what’s up with that?